Meet and Greet service at Stansted Airport, open 365 days a year. 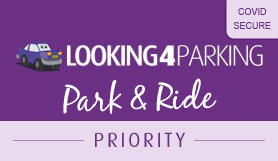 Use this priority Looking4Parking service, and go on your trip safe with the knowledge that your car will be kept in the most secure car park possible, by the best most experienced chauffeurs operated by Maple Parking. Simply call the chauffeur when you are 10 minutes away from the airport and then head towards the Express set down in Zone C. You will be met by a chauffeur and have your car taken away to a nearby secure car park which has 24 hour manned security, fencing and a gated entry. The car park also has the Park Mark award. All drivers parking cars are CRB Checked. Operator holds the Park Mark award for safer parking. No transfers are needed, Looking4Parking Meet and Greet will be an excellent alternative for disabled customers who would find it difficult to use transfer buses. Your car is collected from the terminal when you leave, and brought back to you at the terminal on return. FREE cancellation up until your selected drop off time. FREE bottles of water. You will have water waiting in your car to refresh you on your return. Please call 10 minutes before arriving at the airport. Leave the M11 by the slip road at Junction 8 Southbound or Junction 8a North Bound. At the end of the road follow it round to the left onto A120 Thremhall Avenue. You’ll come to a large roundabout – take the 3rd exit onto A120 Thremhall Avenue. Continue down this road and keep left towards the Bassingbourn Roundabout and take the 2nd Exit onto Thremhall Avenue. At the next roundabout Coopers end roundabout take the 2nd exit onto Terminal Road North. Follow signs for “the Set Down Area Zone C” where you will be met by your driver - park as close as you can to the 2 flag poles. Once you have collected all of your luggage, please call to arrange collection of your vehicle. Your car will be returned to the Express set down in Zone C which is usually where you dropped it off. This is located in front of the airport terminal. This will be located at the front of the airport terminal. Stansted Airport is sited around 40 miles north-east of the city of London, close to Stevenage and Chelmsford. It is close to the M11, after exiting here, follow the signs along the A120 to the airport.